I received an early morning text from a friend alerting me that Rouse’s grocery store had Pork Shoulder Picnic Roasts on sale for 76 cents a pound. That had me rushing right down Tchoupitoulas Street for one of my very own. I’ve got a busy week ahead of me so I didn’t have time to brine and cook in a day or two. I’m also running low on charcoal, so I didn’t think I’d be able to do the entire thing on the grill so I did a basic cheat of starting it on the grill and then transferring to the oven. As a picnic cut usually has the skin on it, I then finished it over high heat to crisp it up for cracklin’. To begin with, I rinsed and patted the hefty piece of pork dry and then scored the skin side and sprinkled Kosher salt into the slits. Turning it over, I rubbed my favorite dry rub (see recipe below) all over the exposed meat. I left it sitting on the counter while I prepped my Weber kettle grill for indirect cooking (a chimney full of charcoal white hot and poured over about 20 unlit briquettes formed into a half moon along one side of the grill) and soaked a hickory chunk in water. I put the hickory and pork shoulder on the grill with the vents part way open and left it alone for three hours. At that time, I preheated the oven to 320 degrees F and then brought the meat in and put it in a pan over a rack with about a cup of water in the bottom. I let it cook slowly for another four hours. 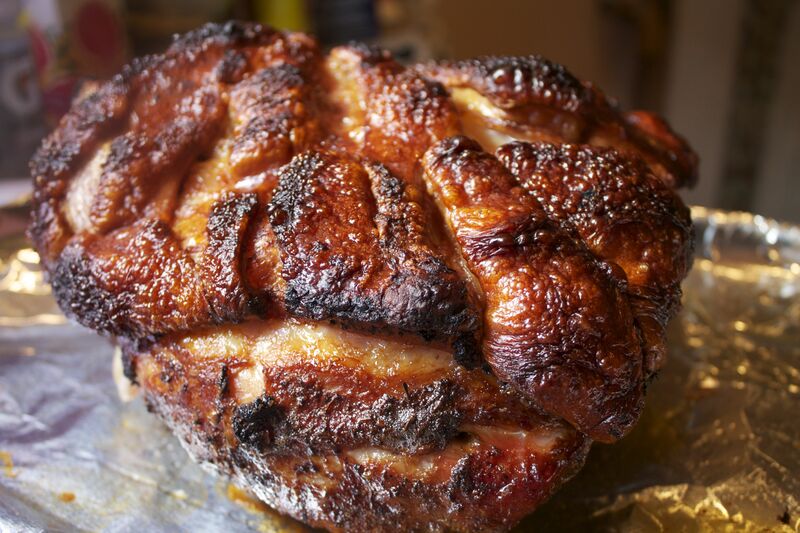 My basic yardstick is about an hour to an hour and a half per pound or until it registers 190 degrees F.
I pulled the pork shoulder out of the oven and transferred it to a baking sheet that I had lined with aluminum foil. I raised the temperature of the oven to 500 degrees F and returned the meat to the oven for about 30 minutes (check and rotate at 15 minutes). 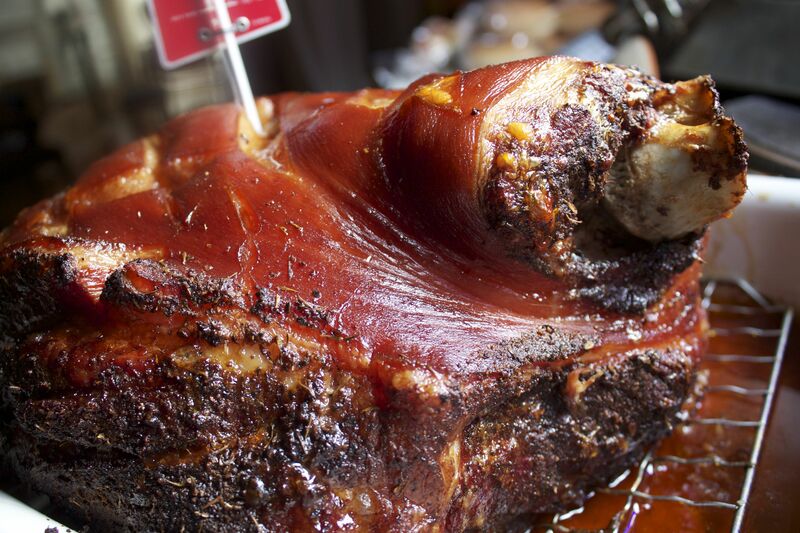 You are looking for the skin to be well browned and crispy and it should sound hollow when tapped with tongs. Remove from the oven and let rest for 30 minutes. Remove the skin and chop into bite sized pieces. Pull apart the meat with forks, discarding any lumps of fat that remain. Combine all of the ingredients in a large saucepan, and whisk well. Bring to a quick boil, then reduce the heat and simmer for at least 15 minutes. Serve warm or chilled. We went to the Southern Food and Beverage Museum and then went to lunch at Purloo (the restaurant in the museum). The museum had an interesting collection of exhibits from the smoke and spice trail to the history of absinthe and a celebration of 175 years of Antoine’s restaurant. 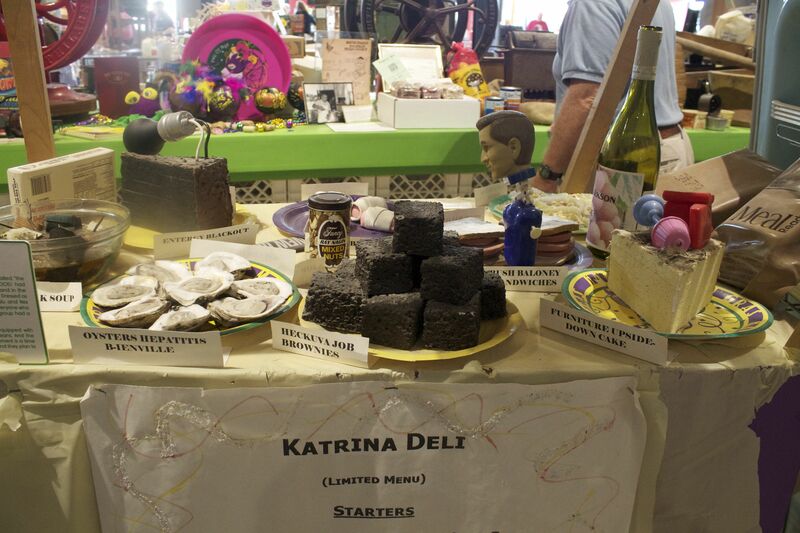 I enjoyed the Katrina Deli and their “Heckuva Job Brownies,” although the Bush Baloney sandwich, Furniture Upside Down Cake and Entergy Black Out Cake all looked good too. After making our way around the museum, we headed through the curtain to the restaurant. With windows all along one wall it is light and airy, with a beautiful restored wood bar for drinking and seats around the open fire kitchen for those who want to watch their food being prepared. We sat at a table and ordered iced tea to drink while perusing the menu. 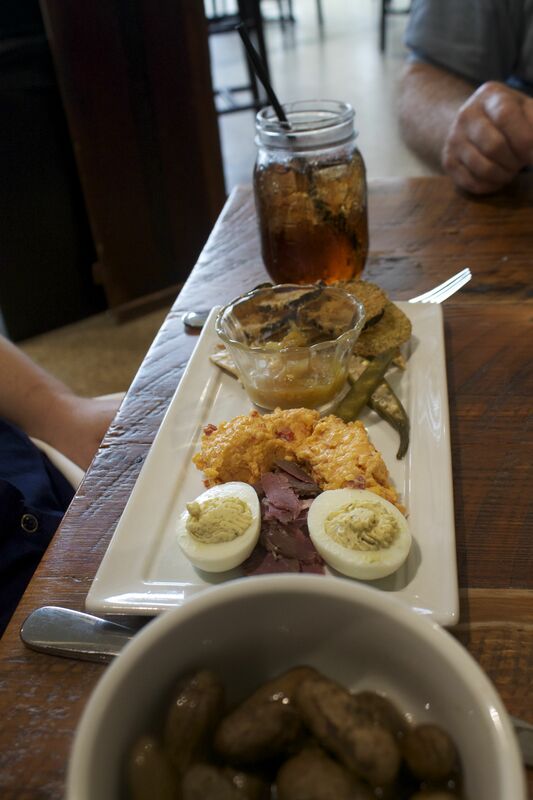 Michelle chose the small plate of the Southern board with pimento cheese, smoked lamb, deviled eggs, green tomato chutney, fried pickles and boiled peanuts with a pecan root beer. The boiled peanuts were a bit bland but the pimento cheese was tasty and the bite in the deviled eggs was pretty unique. Mom went for the signature burger. 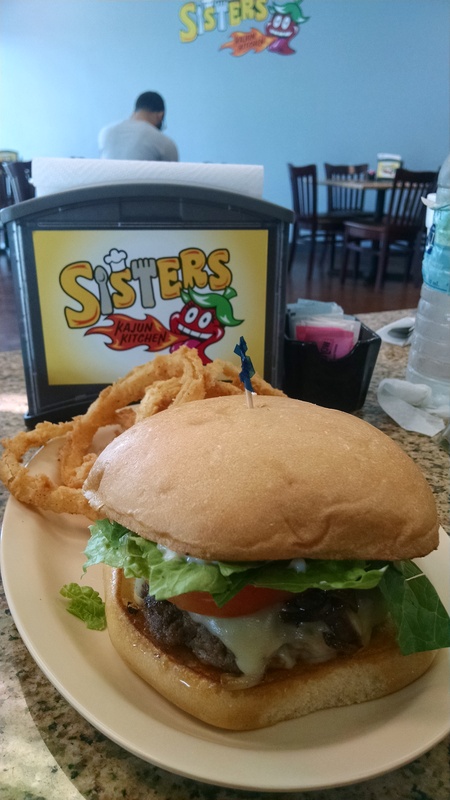 A good burger, thick and meaty and cooked to order with cheddar cheese dripping down the side. There was a pickled okra on the salad that offered a nice contrast to the lettuce. Dad ordered the OCH roast beef debris sandwich with sweet potato fries and grilled onions. 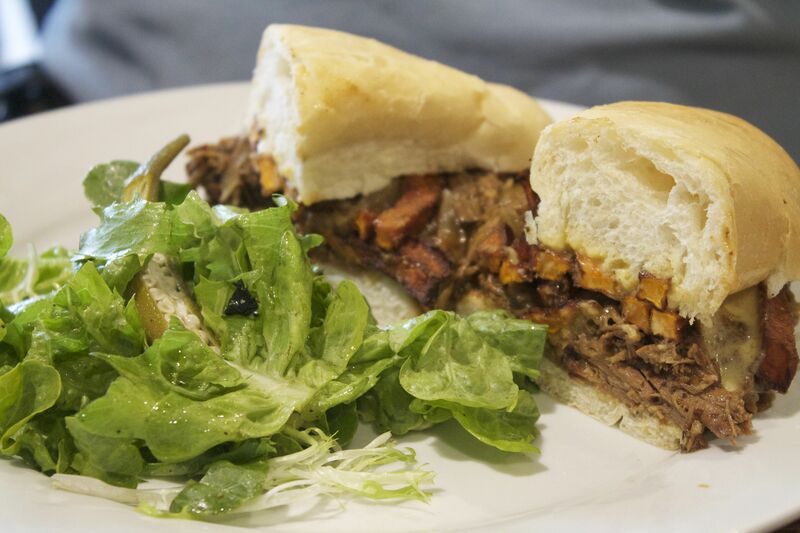 Delicious slow roasted beef but the bread wasn’t typical poboy style so the meat to bread ratio was a little off. 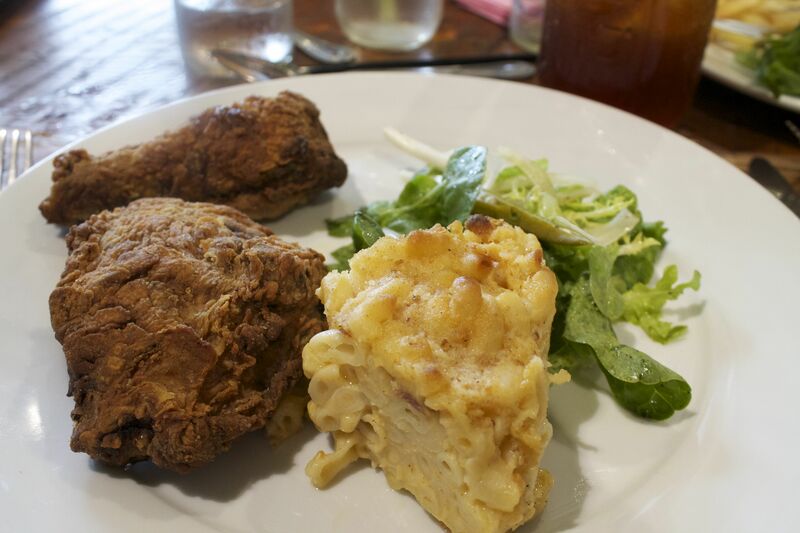 I ordered the fried chicken with tasso mac and cheese. 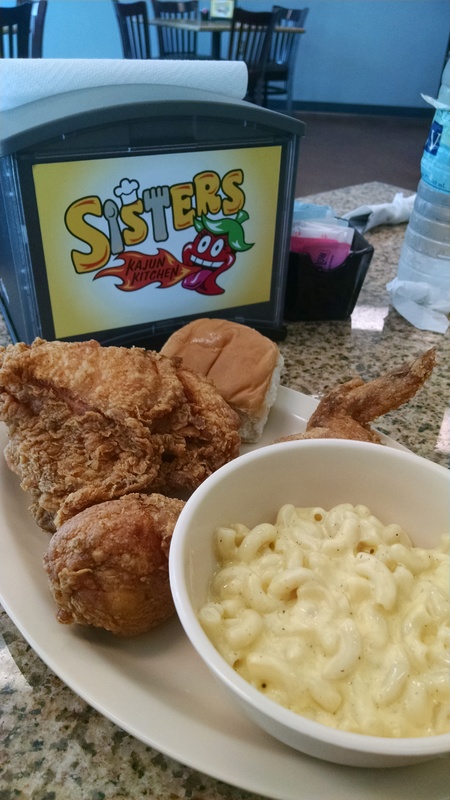 The brine used on the fried chicken was a bit salty and the crust a little heavy and dark from the oil. The mac and cheese was a little bland, I was expecting more from the tasso. The server was being run ragged as she was the only one working the floor (there was a bartender and two cooks). It is hard not to blame the server when the drinks aren’t refilled and she doesn’t check in but maybe they’re still working on staffing issues. I think I’d wait to visit again for them to work on a few of the staffing issues but the food was intriguing enough to make me want to give them another chance. 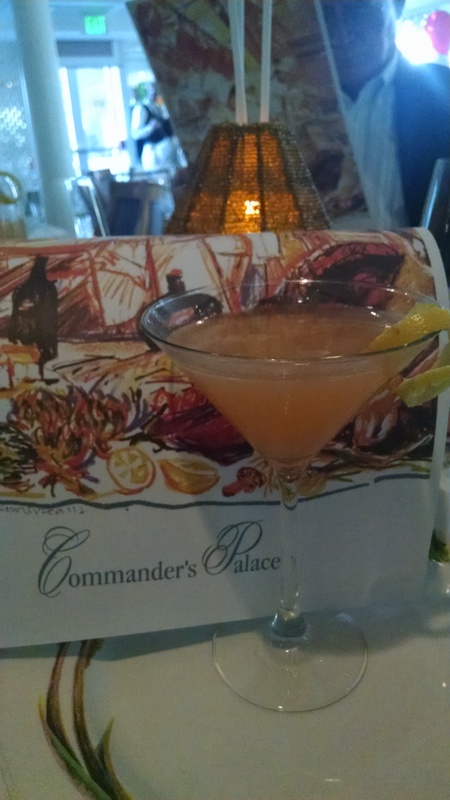 Yesterday was my birthday and I was able celebrate it at Commander’s Palace with my parents and Michelle. For a long time I’ve wanted to do dinner here and the meal was everything I hoped it would be. The restaurant is such a New Orleans icon and has had so many major chefs working there from Emeril Lagasse to Paul Prudhomme to the current chef, Tory McPhail. It serves haute creole cuisine with lots of local seafood and vegetables. Stepping inside is like stepping into another world, where the staff all greet you and seem happy to have you there; not just resigned to slogging through another shift. I recommend reviewing the menu first (available as a pdf) so that you have an idea of what is available. They do have a number of specials from the chef but being prepared helps, especially as I wanted everyone ordering something different so we could all try many things. We started with cocktails and I had the Tequila Mockingbird, which I mainly got for the name (as that is my favorite book) but I really quite enjoyed the addition of limoncello to my tequila drink. Very light and refreshing. 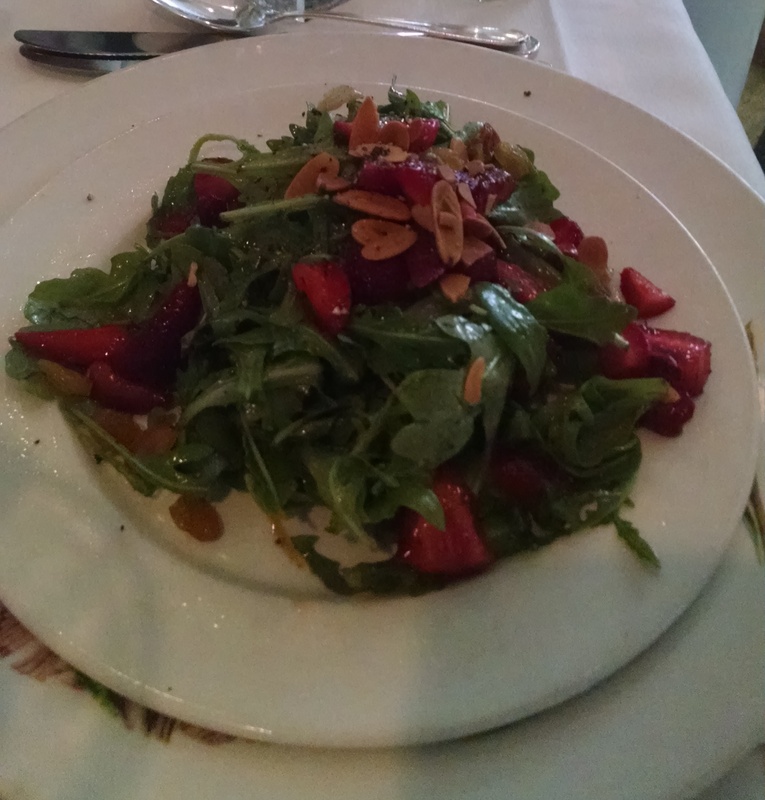 Mom started with a strawberry arugula salad that was delicious but was missing the bleu cheese. As I’m not a bleu cheese fan, I thought it was fine without. The soup of the day was a white bean with spring lamb. 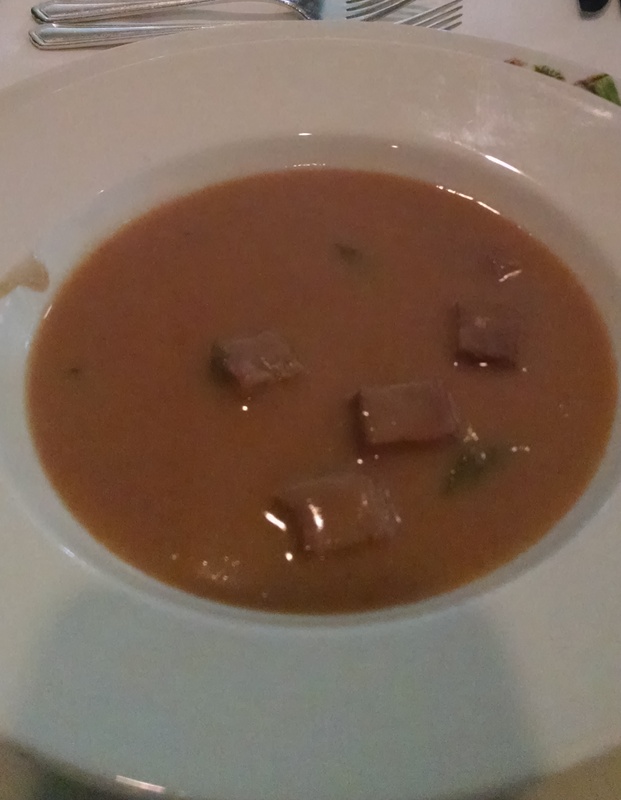 I love ham and bean soup and this was a slightly lighter version. 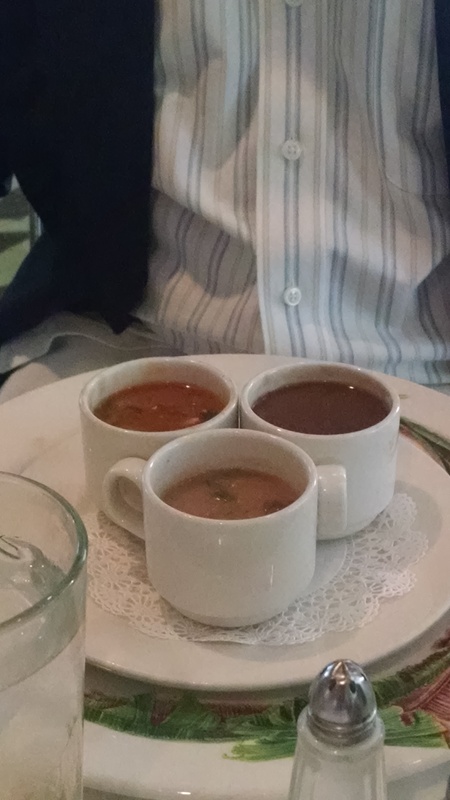 Dad with for the 1-1-1 soup combo so he was able to try the gumbo, turtle and soup de jour. He really, really liked the turtle and intends to order a full bowl of it next time. 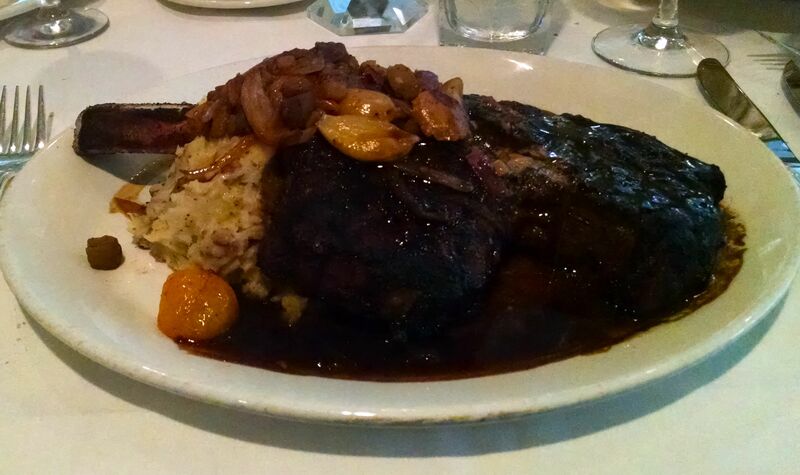 I skipped on any starters because I ordered the 24 oz cowboy ribeye. It had a creole spice and a caramelized onion-cracked pepper gravy. I don’t usually like a lot of extras on my steak but the meat was cooked perfectly to medium rare and the sauce did add a nice touch. Unfortunately the picture I took does not do it justice. 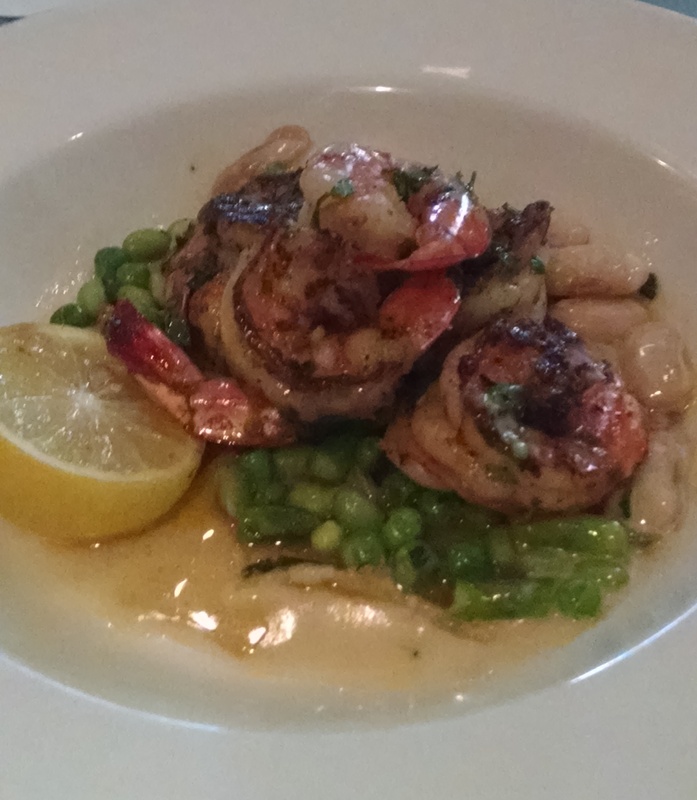 Mom got the grilled white shrimp with a citrus beurre blanc. Very large and tasty shrimp and the sauce was quite different from anything else I’ve had before. 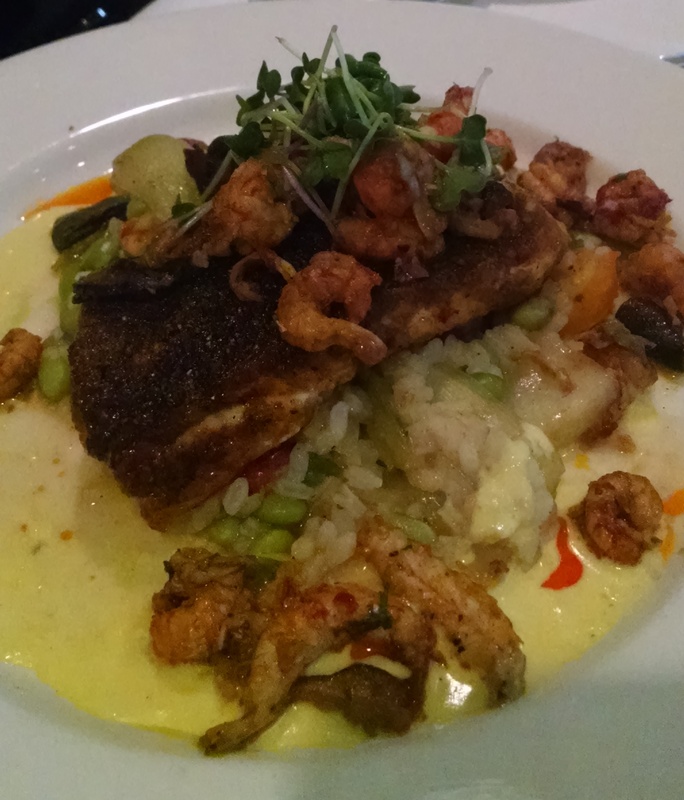 Michelle had the cast iron seared crispy redfish with mushrooms and crawfish tails. The sauce was a sweet corn soubise (bechamel sauce with a puree of corn). The seasoning was delicious and the fish was moist and flaky. Dad kept sneaking the crawfish tails off her plate, so I’m assuming they were good, too! 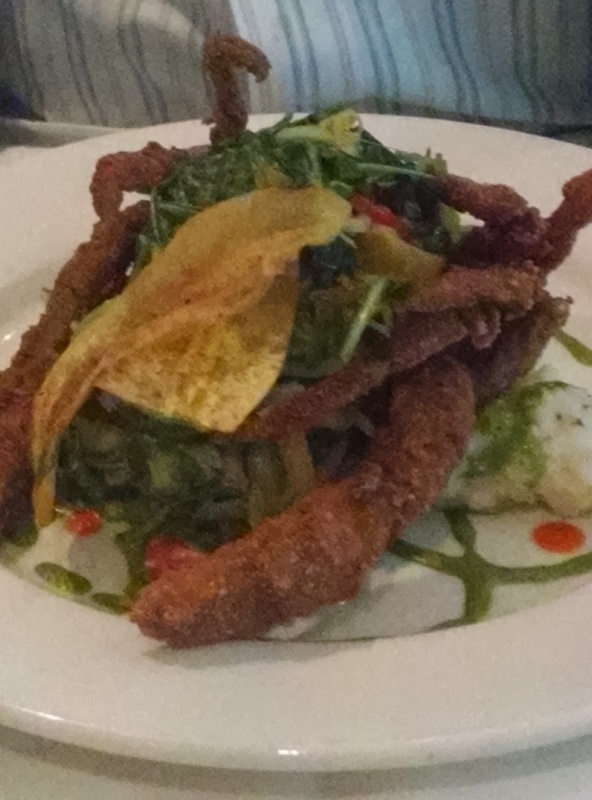 Dad really enjoyed the soft shell crab. It was a very large crab, so the veggies on the plate didn’t get eaten. Can you say the acorn didn’t fall far from the tree? Anyway, he thought it was pretty terrific. 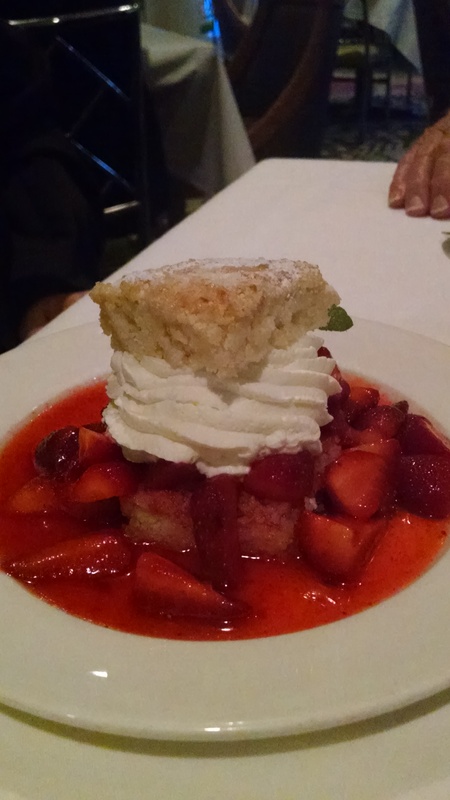 For dessert, Michelle had the strawberry shortcake with a buttermilk biscuit. While I prefer a pound cake or sponge cake to go with strawberries, Michelle thought the dish was unfreaking believable. The biscuit was fluffy and the strawberries weren’t too sweet. She lists it as the best strawberry shortcake she’s ever had. 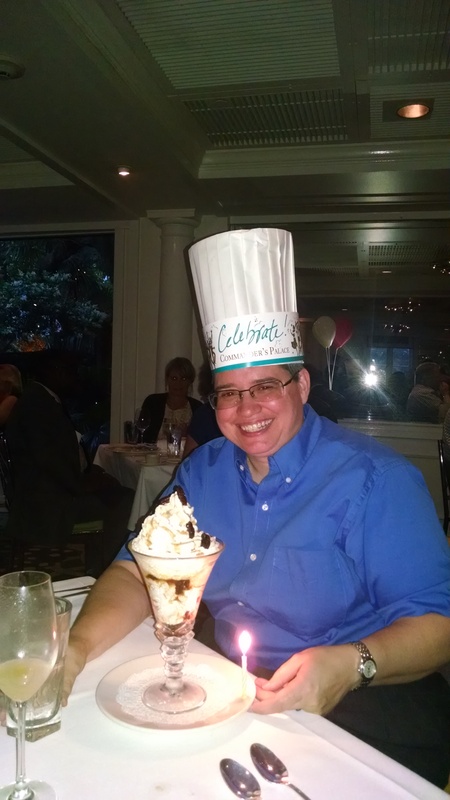 I ordered the Praline Parfait and it came with a hat and a candle. House made vanilla ice cream, with candied pecans and a sticky praline syrup. Rich and creamy and so very good. 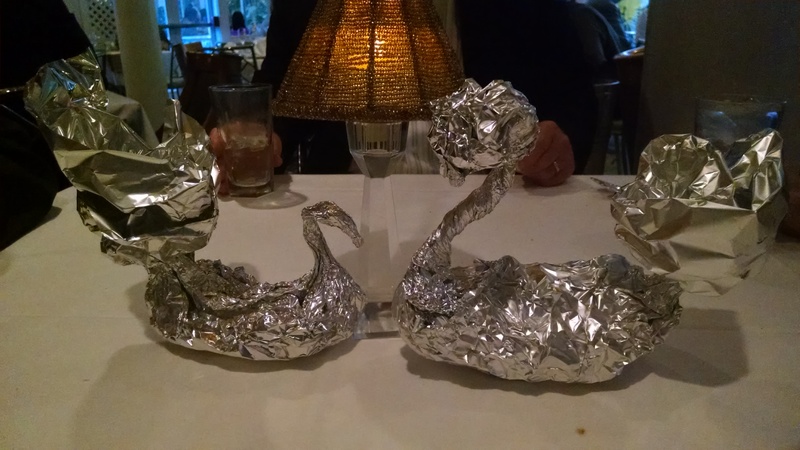 We took our leftovers home in cute little aluminum foil swans. The service was impeccable with drinks refilled before the glass was empty, all of our dishes were presented at the same time and the staff was friendly and personable. This is an expensive place to eat but worth every penny when you want to have a special night out. I had heard about bacon cheesecake from a friend who had purchased one from New Skete Monastery and described it as heavenly. I then prevailed upon Michelle to make me one for my birthday. 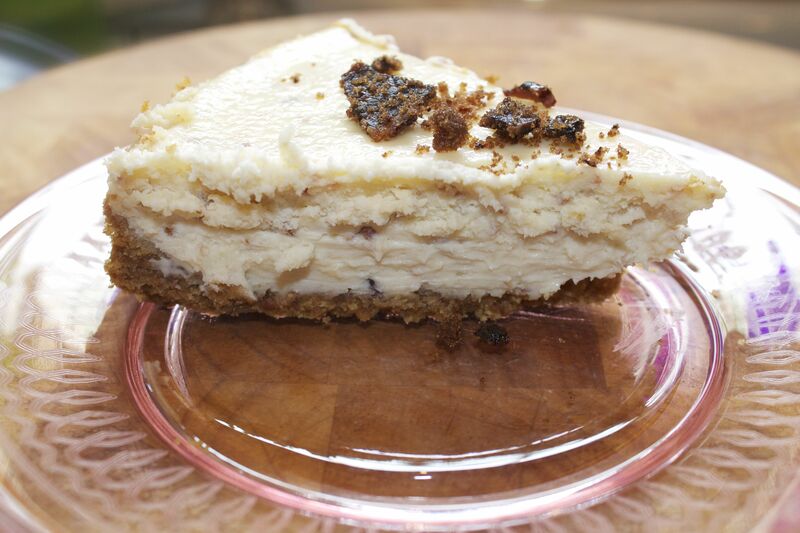 What I like about this recipe from Bacon Goddess is that there is bacon (and bacon grease) in the crust, bacon in the cheese cake and even candied bacon crumbled on the top. Doesn’t that sound awesome? It certainly tastes good! Here it is, with only some slight alterations, as the candied bacon is actually just gilding the lily. This step can be done in advance: bake 6-8 bacon strips crispy enough to crumble well. Use a food processor to crumble the plain bacon very finely in one 2 strip set (for the crust) and a 4 strip set crumbled coarsely for the filling. Grease a 9 inch springform pan, making sure to get it up the sides. Blend the graham cracker crumbs and sugar. Melt the butter/bacon grease and slowly pour into the graham cracker/brown sugar mixture. Add the 2 strip pile of very finely crumbled bacon and mix well. Once it is completely combined, start pressing the mixture into the bottom of the pan and up the sides a bit. Bake at 350 degrees F for 8 – 10 minutes or until nice and browned. Take it out of the oven and let it cool completely, then grease the sides of the pan well above the crust. Beat the softened cream cheese until it is creamy. Add the sugar and vanilla and beat well. Add the four strip pile of bacon and continue to beat until creamy. Add the eggs one at a time and just beat well enough to blend – do NOT over beat or it will force too much air into the batter and cause the cake to fall when removed from the oven. Scrape the sides of the mixing bowl regularly as you blend. Pour your batter into the greased pan on top of the baked/cooled crust and tamp it down gently to settle the filling. Put it in the oven for 35 minutes. Place a pie dish filled about 2/3 full of water on the bottom rack while you bake your cheesecake. When the timer goes off take out the cheesecake and run a very thin bladed knife carefully around the inside of the pan so it can pull away from the pan properly. Put it back in the oven, turn off the oven and crack the door. 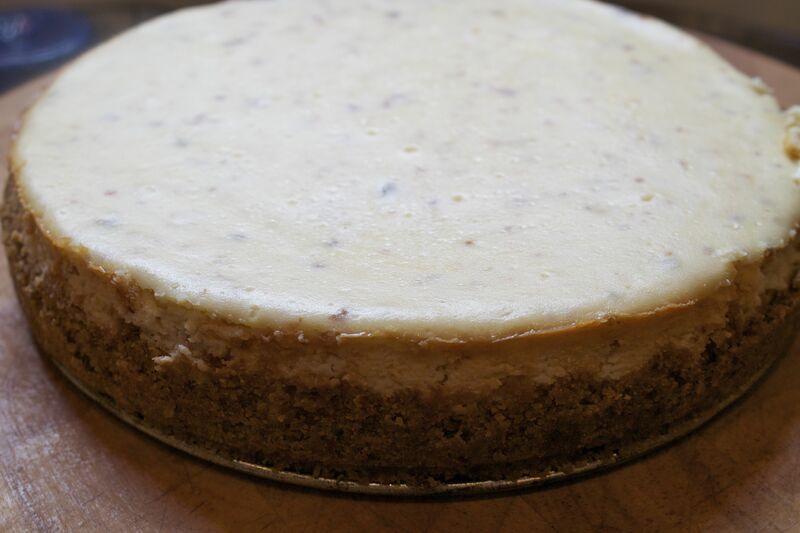 Let the cheesecake stay in the oven as it cools to finish the baking and prevent cracking, about 40 minutes. Take it out and remove the springform sides now. Alternatively, let it chill in the fridge overnight before removing from the pan. In any event, let it chill at least three hours before eating. *Author’s note – we made this with equal amounts of butter and bacon grease in the crust. I would recommend shifting the ratio’s a bit with a bit more butter than bacon grease, as the flavor got stronger the next day. I think the next time, I will 4 tablespoons butter to 2 tablespoons of bacon grease. Hull and puree the strawberries and then put them through a strainer to remove the seeds. 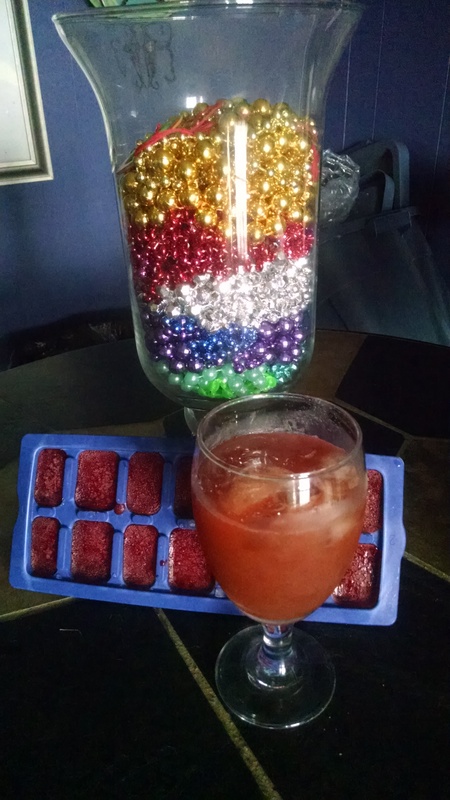 Freeze the resulting strawberry juice in ice cube trays. Steep tea bags in 1 quart of near boiling water for five minutes. Add 3 to 4 strawberry juice cubes (about 1 per 8 ounces). Stir well. Add lemon juice to taste. Pour over ice to drink. I was over in Lafayette today and finished up at the Mall of Acadiana for lunch time. 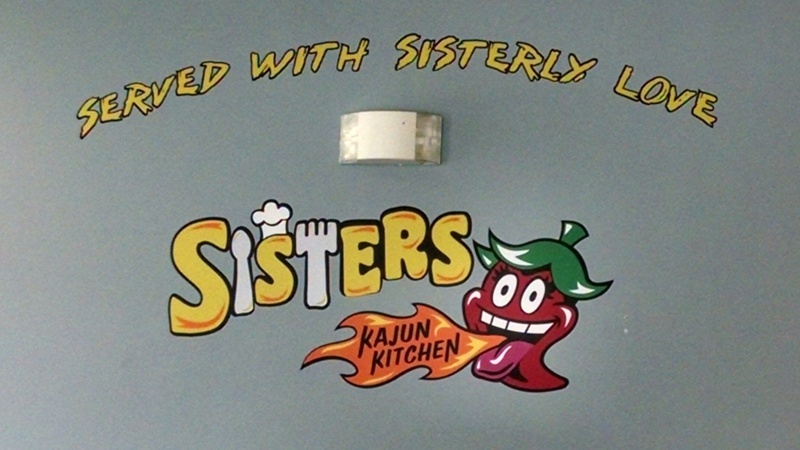 Using Google Maps ‘explore nearby’ for ‘quick bites,’ we came across Sisters Kajun Kitchen just a little way down the road. I ordered the fried chicken. It came to the table piping hot and well seasoned with a nice, light coating. Very well done and I ate every bite. The mac and cheese was rich and creamy. A cut above average, this was not your usual macaroni and cheese. Michelle ordered the Dylan’s Kajun Extreme Burger, based on all the reviews. It was a very large beef patty with grilled onions, tomatoes, lettuce and sauce on a very delicious sourdough bun. 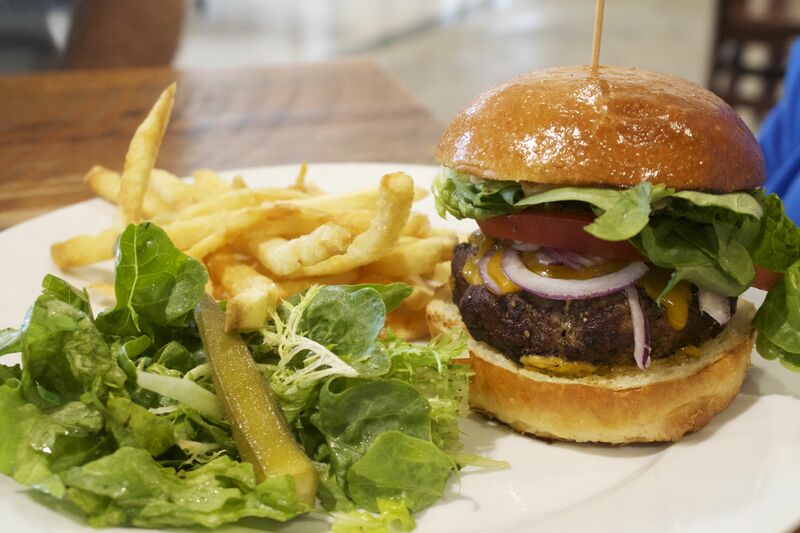 Juicy burger with lots of flavor to go with its mammoth size. She ordered the hand battered onion rings with it and they could have used a little rewarming but had a nice crunch and flavor to them. Reasonable prices, good selection and very friendly folks working there. An unexpected jewel on Johnston Street and worth a visit.